Business can be pleasure ... and pleasure can mean business! In a world weary of stale goals and incentives, we now present to the world of business what is proving to be a fresh new standard for sales or membership enhancement and sheer pleasure...indeed, what many of our clients have fondly called their finest travel experience...a cruise! Our commitment is to enable each guest to experience the greatest results for the dollars they spend. We take the needs of companies and associations into consideration, use our knowledge of the cruise lines, and ﬁnd the perfect fit for our guests. Friendly Cruises offers nothing less than completely packaged travel... custom packaged to include those modes of transportation, destinations, service and facilities that our research has indicated to be basic to a successful incentive and meeting trip. Call 480-358-1496 today for information! In a world weary of stale goals and incentives, we now present to the world of business and associations, what is proving to be a fresh new standard for sales or membership enhancement and sheer pleasure....indeed, what many of our clients have fondly called their finest travel experience......a cruise! "Corporations and associations of all sizes spend a large portion of their annual budgets on training, recognition, meetings and retreats. 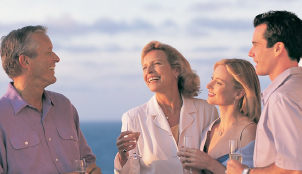 Friendly Cruises commitment is to enable each client to experience the greatest results for the dollars they spend. That is our purpose in helping each company or association find that "perfect fit" between their needs and the many fine cruise lines we deal with." Friendly Cruises ... Making a difference! We help you clarify your convention and incentive goals long before the cruise is announced to your participants. We have identified, and are pleased to provide, virtually every planning and coordination function required to meet those goals. Nothing is left to chance. Such detailed planning and control of your cruise are initiated as soon as you book. This process includes assignment of experienced Friendly Cruise representatives to assist you with your complete program. Meetings are arranged between appropriate personnel in your organization. Facilities and services are allocated aboard ship to enable and enhance your firm’s exhibits, presentations and seminars. Assistance is rendered to ensure that all social aspects of your cruise are properly dispatched, including pre-planned seating arrangements, diverse entertainment for spouses, special theme parties and banquets. Your cruise and shoreside experiences are designed more effectively, efficiently and economically than possible by other organizations because of Friendly Cruises unique ability to control large blocks of cruise ship space. Friendly Cruises offers nothing less than completely packaged travel...custom packaged to include those modes of transportation, destinations, service and facilities that our research has indicated to be basic to a successful convention and incentive trip. Test your cruise quotient ... Did you know? A cruise is an ideal incentive for increased performance. Nowhere, in all the civilized world, is there a more eloquent statement of "the good life," a rarefied devotion to superb career performance. Your cruise is available when you desire. Often a particular niche of time is more appropriate than others on the annual business calendar. Because of the number of cruise lines Friendly Cruises uses, chances are very good that your cruise will be available when you desire, including during peak season. Your guests will take home more than memories from their cruise. 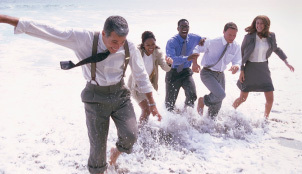 Having enjoyed new camaraderie among their associates, they will feel a part of a more cohesive organization. Business will have been successfully accomplished on a much more pleasurable level. You will come away having accomplished your task, as well as having built a true group spirit and goodwill. Your cruise facilities spanning a variety of needs include large conference rooms and auditoriums to private executive suites, with food and beverage service tendered as needed. Theaters--luxurious, comfortable and functional--await your special event scheduling for sales presentations, training films, awards ceremonies and participant skits. Banquet size dining rooms with panoramic sea views provide an unexcelled environment for that special dinner followed by awards presentations. A full complement of support services are available. These encompass audio visual, reproduction, office supplies, communication equipment and services - even storage rooms for personal materials. Business-related services comprise daily news, stock quotations, worldwide telephone and Telex services. 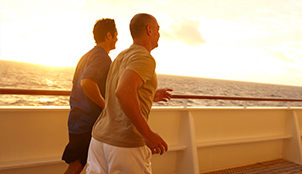 Cruising with your organization offers your members surprisingly competitive savings.